MBA from IIM (Calcutta) and Economics (Hons.) from Stephens College, Delhi and schooling from Presentation Convent, Delhi. She is an HR and Organisation developments specialist over 20 years of varied experience in the industry across different sectors including manufacturing & services sector. 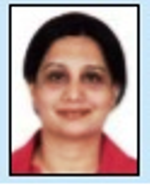 Sushma worked briefly as Strategic Advisor (HR) with Hero Motors India Ltd at Vice President level with the company and was with Maruti Suzuki India Limited for a total of 15 years, her last role being Department Head, Corporate HR .In her present capacity ,Sushma is OD /HR consultant at the strategic level, specially on performance Management, dashboards for Performance Reviews, structured recruitments & employee assessments as well as recruitment & training top managers in organisations.